This Can't Possibly Be Kanye's Insane Tech Start Up, Can It? Earlier this year, Kanye West went on an epic Twitter berserker barrage that was so insane it promised to revolutionize tech, architecture, education and everything in between. Apparently (emphasis on APPARENTLY), his first project with his new start up, Donda Media, popped up in beta last night and it's... uhh... what the hell? Donda Media—or whoever is behind this—launched WhoDat.biz with the tagline that it's 'The Facebook of Websites' which is a little bit confusing because I'm pretty sure Facebook is already the Facebook of websites. But even if we ignore the fact that a Facebook for websites exists, well, WhoDat.biz is still nothing like Facebook. It's just a whois lookup for websites, a tool to use to find out who owns what websites and totally a thing that many other websites already do? You could say that WhoDat.biz does it with less annoying ads and prompts to buy a domain but still, this is it? This can't be real, right? I mean, say what you want about Kanye, but generally his websites are well designed, tech-forward entities. So why is he using a generic Tumblr skin and Gmail address? And something tells me he wouldn't be using his dead mother's name for something like this. OH, speaking of names, pretty sure Kanye never, ever referred to DONDA as Donda Media when he first started talking about it. Know what all of this adds up to? A prank, a hoax, a troll. After that whole spiel the website has a place to enter your URL (as indicated by spiffy hipster non-prescription glasses) and a WHO DAT? click bar to initiate the search. If you search a website, you get its deets. 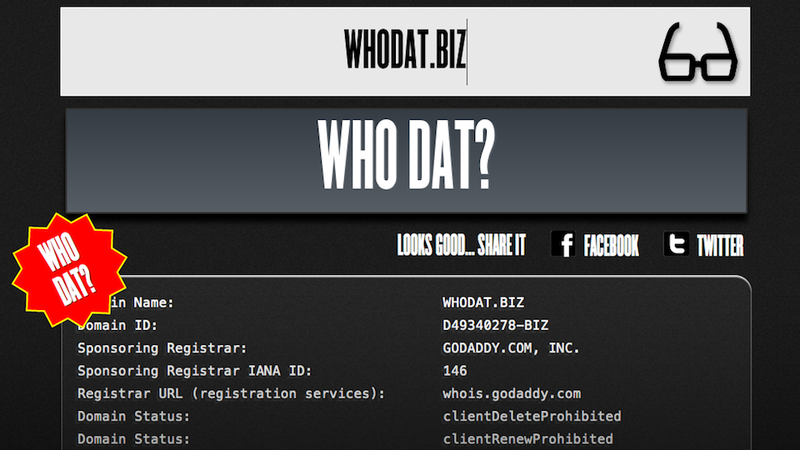 Typing in WhoDat.Biz shows you that it was registered through GoDaddy by Donda Media which is headquartered in the Empire State Building with the e-mail address of DondaMedia@gmail.com. And yeah. That's it.